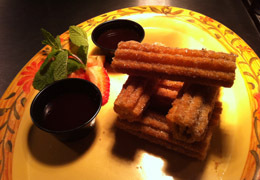 We must remind you to leave room for a delicious Churros dessert. Crispy Mexican Style Pastry, Dusted with Sugar and Cinnamon. Original or Filled with Cream Cheese.